Rollin Lane, 88, sits with Kim, left, his 57-year old daughter with Down Syndrome, and Kris Zamora, right, in his Leominster home. 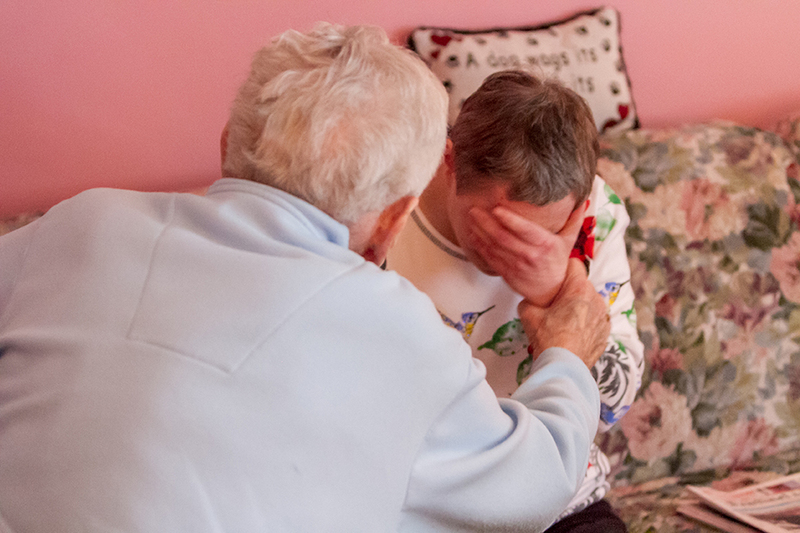 After caring for Kim for her entire life, Rollin’s declining health has forced him to seek assistance with caring for Kim. Leaving her family in Ohio, Rollin's other daughter, Kris Zamora, visits every few months to assist Kim and Rollin for weeks at a time. Taking the role Rollin once played, she cares for them both by cleaning, cooking, doing the laundry, and running errands. However, her efforts to aid Kim are often not received with gratitude. “It's frustrating to not have that returned,” Kris says about having a sister who is non-verbal. 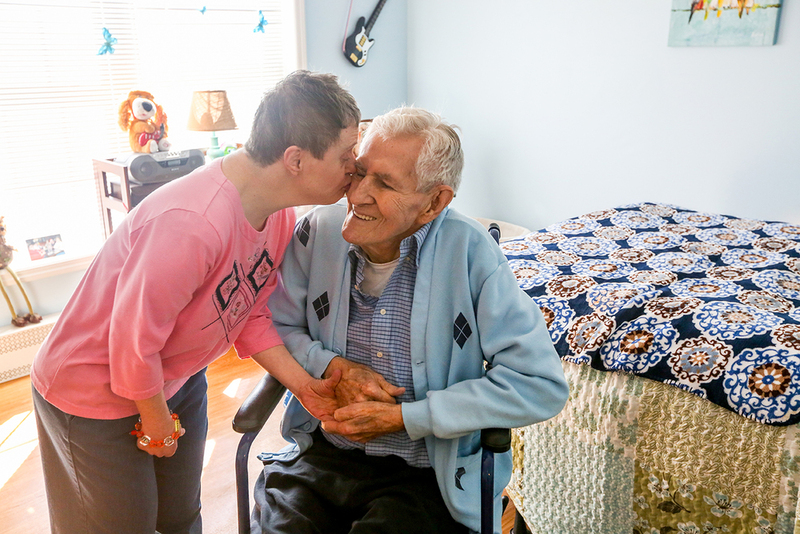 Kim has lived with Rollin all her life, and despite his declining health, Rollin has been the primary caregiver for his daughter. As a person with special needs, Kim needed constant one-on-one supervision and after the passing of his wife 15 years ago, Rollin has bathed her, dressed her, and fed her as a parent would a child. While many his age are well into their retirement and many relocate to senior living facilities, Rollin took on the responsibility for caring for his daughter. However, over the years, Rollin’s health and ability to care for Kim declined, which made finding help for her a necessity. Rollin hands Kris a bottle of baby powder through the door as Kris assists Kim with cleaning after a failed attempt at using the bathroom. The choice was clearer when it became an issue of Rollin’s health and Kim’s safety. “She wasn't giving him any peace,” Kris recalls. “As much help as we gave, she was wandering. We had to make sure the doors were locked.” Rollin’s use of a wheelchair and older age made daily tasks like bathing, dressing, and feeding Kim difficult for all involved. When Kim would start having sporadic crying fits, it was especially tough for Rollin. “ She would be hysterical, very afraid and scared.” She stopped taking interest in the activities she enjoyed, like watching her favorite TV programs, going bowling, and participating in workshops at the ARC in Fitchburg, a community-based organization that helped those with intellectual and developmental challenges through job placement and training. Kris and Rollin agreed that they couldn't do it anymore. Kris was no longer able to care for her father and sister together by herself, and Rollin was no longer able to care for Kim by himself. They needed a solution where Kim could be more independent and have the support she requires. They needed to find Kim a second home. Kris assists Rollin out of his Leominster house as they visit a housing solution for Kim. From left, Kim's DDS caseworker Cheryl Lebeuf, Kris, Rollin, and Seven Hills Residence Director Freda Archeval, meet with Venture Community Services Day Program Director Elizabeth Bond, as they tour the Venture Community Services facility in Fitchburg. 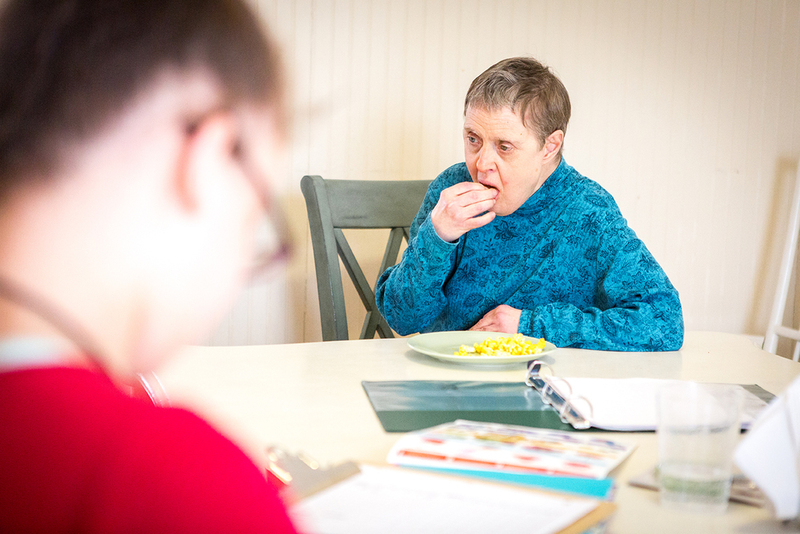 In addition to residing at the Seven Hills, during the day Kim will have the opportunity to participate in the Venture Community Services program , which provides special-needs individuals with life skills and personalized support throughout the day. From left, Kris, Freda Archeval, and Rollin, discuss the logistics and forms involved with Kim's admission into the Venture Community Services program with Kim's DDS caseworker Cheryl Lebeuf. Relief came when Kim's caseworker from DDS told Kris and Rollin about a community residence operated by The Seven Hills Community Services Foundation in Leominster. The live-in facility, a four bedroom family style home just ten minutes from Rollin's house, provides clinical, educational and community-based assistance to people like Kim. Direct Support Professional Gifty Borquaye assists Kim with preparing dinner for the members of the home. Supported by staff 24/7, Kim thrives at Seven Hills, where she is able to live more independently and receives the emotional, social, and physical support she needs. She lives there during the week, improving her cognitive and social skills. On weekends, the staff can assist Kim with returning home to her father if he has assistance at home. Freda Archeval, the Residence Director of Seven Hills, can see the change in Kim when she’s there. “She’s more independent. She dances…She helps with the cleaning, she likes to be in the kitchen.” Archeval even recalls the time Kim bathed herself. Kim enjoys a snack after helping prepare for dinner at Seven Hills. Kim’s successful transition to her new home wasn’t an easy process for Kris, who compares the change to sending your kids off to college. A framed photo of Kim and Rollin when they were younger. After nearly eight years of traveling back and forth from Ohio to care for her father and her sister, Kris now has some of her freedom back in her life. Rollin is able to visit Kim often and see her succeed in her own environment. “I'm a firm believer in the fact in that the people there really care about these kids. Everything I’ve seen proves it. The folks are very patient, very accommodating, and very loving.” Kris can see a difference now that Kim is a resident at Seven Hills. While the last few months have been a time of transition for the family, the changes have been in everyone’s best interest and Rollin knows his daughters will always be there for him, and for each other.